What is true wealth? Answer: Funding your contentment and the ability to underwrite a meaningful life. Brian Portnoy magnificently explains this in his new book, The Geometry of Wealth. He answers one of life’s eternal questions: Can money buy happiness? Yes, but Brian has an important caveat. Investment advisors need to pivot toward becoming happiness coaches. Nothing is more valuable than teaching someone how to responsibly enjoy their good fortune. Conversations centered around “smart beta” function as a sleep aid for the average Joe. While you’re speaking they’re thinking this. “Am I going to be O.K and preferably happy?” This pertains to them exponentially more than any elegant chart. It’s harder for lower income people to be happy. They have fewer resources to relieve hardship (e.g., paying for good medical care). The wealthy use money to relieve sadness and, if properly instructed, to increase happiness. Connection – The need to belong. Control – The need to direct one’s own destiny. Competence – The need to be good at something worthwhile. Context – The need for a purpose outside of one’s self. Stocks and bonds are important components of a diversified portfolio. They are meaningless assets if not attached to a meaningful life. The good news is a financial and happiness portfolio can be combined. 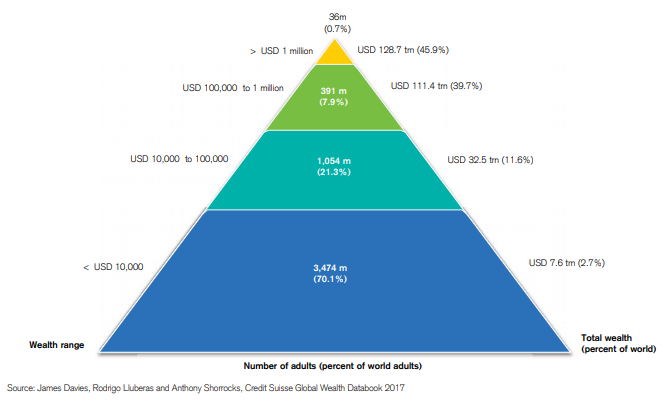 We run across many who are near the top of the wealth pyramid. The sad fact is some aren’t happy campers. They worry about markets. They spend time getting worked up listening to political partisans. They create toxic energy complaining about millennials, immigrants, or the scapegoat du jour. Connect – Stay in touch with old friends and make new ones (preferably with people that come from a different generation and political persuasion than yourself). Find a job where you like your co-workers and would befriend them even if they weren’t in the next cubicle. Control – Create a daily schedule of meaningful activities when possible. For retirees, this is essential. Watching T.V. and finding the best early bird specials don’t count. Think about starting your own business. Being part of someone else’s plan can be detrimental to your health. Competence – Be the best you can be at your job. If you have no desire to do this, it’s time to look for new employment. Wealth can buy more than fancy cars and expensive meals. Take advantage of coaches, tutors, and educational opportunities to build skills. Workaholics aren’t happy people. Master a hobby to benefit yourself and others. Context – Selfishness isn’t a good look. Donate money or, better yet, time to a cause that is close to your heart. The more energy devoted to a cause bigger than yourself creates fewer opportunities to stew over perceived insults and imaginary perceptions. Effectively employing strategies to fund your contentment is the only benchmark that matters. Anything else shouldn’t be part of the conversation. 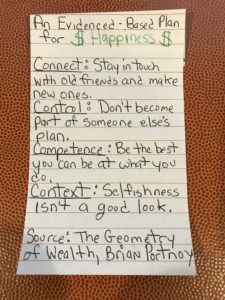 Source: The Geometry of Wealth by Brian Portnoy. If you haven’t purchased this book, what are you waiting for?